MTS purchased 31 minibuses and 46 paratransit buses fueled by propane. Photo courtesy MTS. The San Diego Metropolitan Transit System on Wednesday rolled out its new fleet of buses fueled by propane autogas. The agency said the alternatively fueled buses help reduce its operating costs and reduce emissions by 2 million pounds per year. 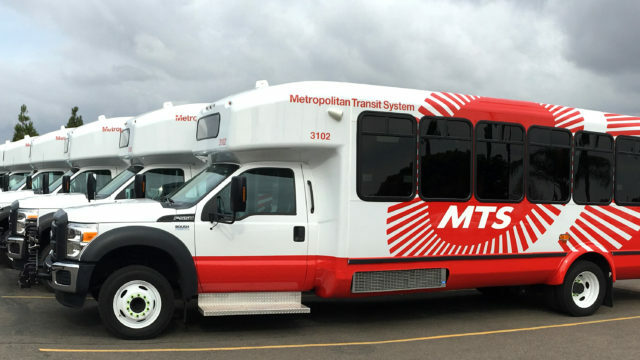 MTS purchased 31 minibuses and 46 paratransit buses fueled by propane; all will be stationed at the agency’s Copley Park Division in Kearny Mesa where MTS operates 178 paratransit vehicles and 37 minibuses. With the switch to propane, 35 percent of the Copley Park fleet is now operating on alternative fuel, according to the agency.